We do our best to always provide new models of copper hoods adjusting to the newest designing trends and also based on clients' specific instructions. Those artefacts are a great addition to our cutting-edge production line. We highly recommend you to check our online rustic products for home improvmement projects to look for the new models of wall mount and kitchen island range hoods. We are not a mass production factory, all rustica range hoods are handmade on individual bases and treated as separate projects allowing the buyer to easily customize the shape, size and color of the cooper range of his/her choice. Furthermore, we can decorate them by adding straps, make crown molding from different metal and even convert the appliance into recirculating type. 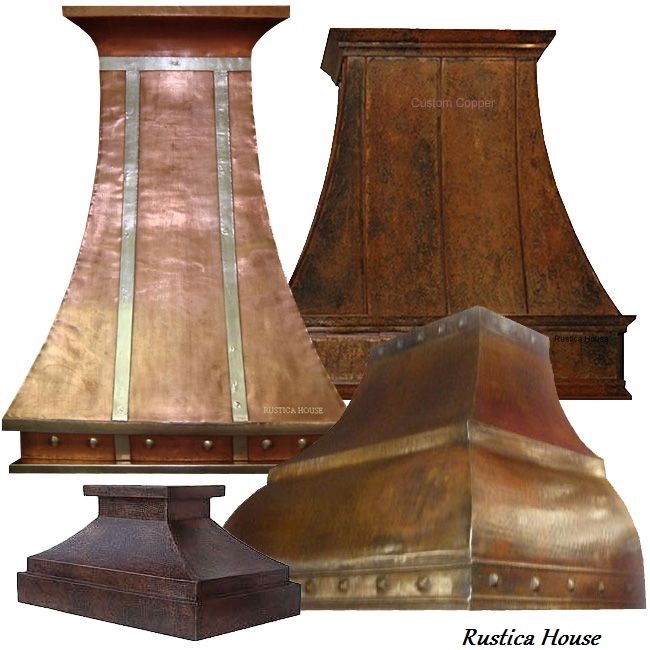 We offer Rustica copper range hoods for wall mount and island in four different patina colour. Custom copper rustica range hoods are available in rustic natural fired finishing that creates a more Southern Texas look. There is a dark coffee patina that fits great in a vintage style kitchen. You can have it done in light washed with darker paint. It makes the copper range hoods seem much older than they are in reality. Our latest inclusion in Rustica copper hood decoration and the most versatile one is natural rusted green. Itt can work for both very modern interior as well as with antique home design. The finished product can be delivered in a smooth or hammered metal surface. However, the second method produces the best copper range hood effect. Copper is an extraordinary material, long-lasting and incredibly elegant. This metal was mined in Mexico for centuries so it was a natural decision to make our production line in Michoacan region which is the heart of Mexico metalwork including copper-smith production. The location of our plant gives us an advantage over the American, Asian or European brands as far as the range hood prices are concerned as the workforce is much cheaper. However, our staff embraces the tradition of copper hood craftsmanship. You can expect no less than excellence.